In a show that sets the nation's agenda, one woman has been our morning companion for the last 16 years. 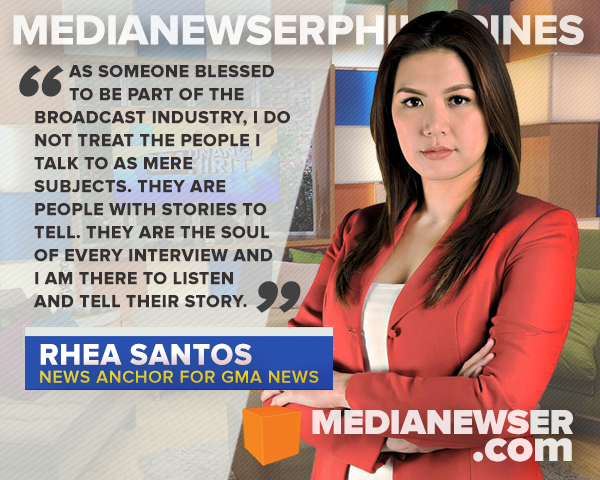 Rhea Santos, the longtime co-anchor of GMA-7's Unang Hirit, has been greeting viewers each morning, delivering the day's news before our very first cup of coffee. 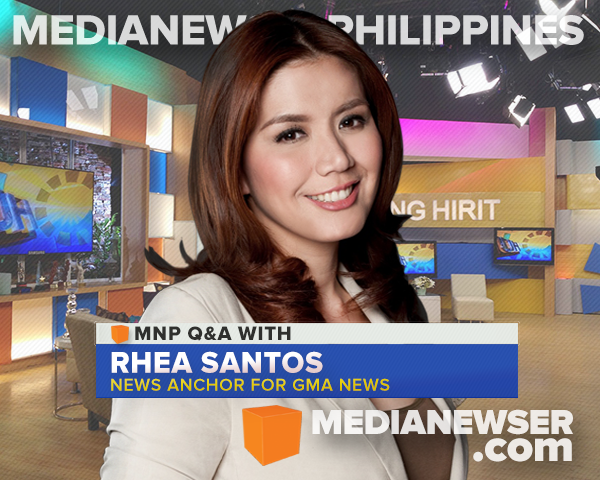 Started as a segment producer and segment host for the show, Santos quickly rose through the ranks to become one of its chief news anchors on the Unang Balita segment. "I’ve been doing the show as a news anchor, correspondent and features host for 16 years now," she said. "The show has taught me everything I know." With her growing credibility and popularity as a broadcast journalist — as evident in UH's uptick in the Nielsen ratings — Santos would eventually join the now-defunct evening newscast Frontpage: Ulat ni Mel Tiangco as anchor of its GMA Action Force segment. She would later on headline her very first solo program, At Your Service, in 2004; and Pinoy Abroad with Ivan Mayrina in 2005 — where Santos spent more than a year trotting more than a dozen countries to tell the story of our kababayans abroad. "Pinoy Abroad is dear to me until today," she said. "It has brought me closer to issues faced by our kababayans working abroad. And who wouldn’t love traveling to 14 countries in one year? But more than experiencing the sights and sounds of a country, I have immersed myself to the real hardships of our fellow Filipinos abroad." Until 2010, Santos, along with Mayrina, also served as anchors of QTV's primetime English newscast News On Q. She would also contribute on GMA-7's venerable news magazine program Reporter's Notebook, covering stories such as the Ampatuan massacre — where she would be reporting on the ground from Maguindanao — while also showcasing her strong interviewing skills with one-on-one interviews with the likes of former Ombudsman Merceditas Gutierrez, Rep. Jules Ledesma, Maguindanao Governor Esmael Mangudadatu; and former officials of the Aquino administration such as the late Jesse Robredo, Ricky Carandang and Edwin Lacierda. Since 2011, Santos has also been the host of the top-rating Tunay Na Buhay. In this edition of MNP Q&A, the queen of morning news talks about her career and journey as a broadcast journalist, who her dream interviewee would be (clue: a very controversial public figure), and why. Be sure to join the conversation below or on our Facebook page. You can also tweet us @medianewserphil. Guiding Principle: Be kind to everyone. You do not know what other people are going through. Tell our readers your story. Who is Rhea Santos, on- and off-cam? On-cam, Rhea is a good listener, a mindful and inquisitive media practitioner and an interviewer blessed with the skill to handle interviews whether light or serious exchanges. Off-cam, I’m a loving wife, a dedicated mom, a thankful daughter, an adventurer and an optimist. What made you want to become a television journalist? I have always wanted to witness historical events unfold, to immerse myself in things I wouldn’t be able to do on my own, to travel places I never imagined, to talk to people from all walks of life. I’m a storyteller and a good listener. I want to be instrumental in informing people about the things essential in their lives and hopefully, influence and inspire them to make their lives better. "I am thankful and deeply honored that the network has entrusted me with a job to serve our kababayans in the morning. If the show still needs what I can offer, I will be very glad to stay where I started my television career." Walk us through your early days at the Kapuso Network. Tell us about your journey from being a segment producer to segment host to eventually being promoted as reporter and news anchor. I started as a segment producer and a segment host for Unang Hirit back in July of the year 2000, three months after graduating from college. I was tasked to cover and produce lifestyle stories, segments on environmental issues, features on fashion and finding jobs. Two cameramen, Kuya Ador and Kuya Toto, would always encourage me to do stand uppers in my segments. I would always be the talent in my segments and would immerse myself in my stories. I would never have produced beautiful segments if not for the help of my editor Kuya Laico. Miriam Quiambao, who just bagged the first runner-up title at the Ms. Universe that time, was a regular host of the show but she wasn’t able to do most of her stints because she was busy with her reign as a beauty queen. I guess the show lacked hosts at that time so after 6 months of working off-cam, our executive producer that time, Neil Gumban, asked me to go on board as one of the hosts of Unang Hirit. I remember my first on-cam spiel was a prayer at the opening of the show. I was also assigned to deliver the foreign news segment of Unang Hirit and was hosting feature segments once in awhile. Eventually, I was doing on-cam work and field reports after my stint at the morning show. Initially, my beat was general assignment. But my first regular beat as a reporter was police and defense which I did for two years. I was also anchoring the hourly newsbreak of GMA in between. I retained my news anchoring duties in Unang Hirit while doing field work and, thereafter, came several shows that were entrusted to me such as At Your Service, Pinoy Abroad, Women’s Desk, DoQmentaries, 100% Pinoy and Reporter’s Notebook. I also did a few episodes of I-Witness and Imbestigador, as well. It was a privilege also to anchor some of the major newscasts of GMA News such as Frontpage and Ulat ni Mel Tiangco and News on Q, which aired on QTV. I was also blessed to be considered to do anchoring duties in 24 Oras and Saksi on a few occasions and learned a lot from handling big coverages such as the 9/11 attacks, the Royal Wedding, the impeachment of CJ Renato Corona, senate investigations and the elections. I have been one of the news anchors of Unang Hirit for the past 16 years and the host of Tunay na Buhay, which is now on its 6th year. You became a household name through Unang Hirit. Tell us about your experience working in and for the show. I cannot imagine life not waking up early in the morning and preparing myself for such a fun, entertaining, educational and informative show. I’ve been doing the show as a news anchor, correspondent and features host for 16 years now. The show has taught me everything I know. It has given me opportunities to hone my skills in research, hosting and doing interviews. I love mornings working with the Unang Hirit people whom I consider family. Tutok na sa pagsisimula ng special coverage ng GMA News 'Panata sa Pagbabago' sa #unanghirit. Where do you attribute the show's continued success? Unang Hirit has become part of Philippine households for 16 years because what the show offers appeal to what viewers need every day. We do not fail to serve up-to-date information to help them go about their daily grind. Complemented with a roster of competent, credible, versatile, fun and approachable personalities, the morning show has become an extension of one’s home. Filipinos have found a tita and tito, an ate and a kuya in us. Our viewers have found their morning barkada. What's it like being the longest serving female morning news anchor in Philippine TV history? Also, do you see yourself remaining as part of the show for the next five years? I am thankful and deeply honored that the network has entrusted me with a job to serve our kababayans in the morning. If the show still needs what I can offer, I will be very glad to stay where I started my television career. One of Rhea's first major projects at the Kapuso Network was the travel program Pinoy Abroad, which ran from 2005-2006. It was a consistent top-rater — regularly beating ABS-CBN's now-defunct Special Assignment — and remains one of the most replayed public affairs shows on GMA News TV. Aside from Unang Hirit, you are best known for hosting Pinoy Abroad. Tell us about your experience co-hosting that show with Ivan Mayrina. Pinoy Abroad is dear to me until today. It has brought me closer to issues faced by our kababayans working abroad. And who wouldn’t love traveling to 14 countries in one year? But more than experiencing the sights and sounds of a country, I have immersed myself to the real hardships of our fellow Filipinos abroad. They trusted me to tell their stories back home and that means entrusting their hearts to me, as well. I am privileged to have seen them triumph over adversities. I’ve also held a big responsibility to inform concerned government agencies about their plight. Hosting it with my "bro" Ivan made it more fun. We started working in Unang Hirit at the same time. We’ve hosted and anchored several shows together. It has always been a breeze working with him. During our Pinoy Abroad stint, we would have exciting stories to share whenever we meet. People would always say we have "chemistry" and true enough, we don't need cues and scripts when we do a show together. "I am blessed to have the gift of sensitivity to my interviewees, a listening heart and the ability to throw the right questions. In exchange, the people I talk to entrust a part of their lives that has never been discussed before." Tell us about your stint on Women's Desk and At Your Service? The show Women’s Desk carved a place in my heart because the issues the team fought for were the same issues I am passionate about as a woman. This has become an advocacy for me — to inform women about their rights and encourage them to draw the line and speak up when they become victims of abuse and violence. Being a mother also has given me more fire to fight for the protection of children. That will never change. I am just thankful that the show has given me the opportunity to become instrumental in my own little way to make changes, to be part of a group of dedicated people who rescue abused women and children, and to inspire women to fight for their rights. At Your Service, on the other hand, brought me to the people and allowed me to encourage and inspire them to be part of the solution in the problems of their communities. I was part of a team anchored in hard work, perseverance and compassion. The best part at the end of our day was gratitude from the people we have inspired and worked with. It was a show filled with smiles and positivity, and it taught us that we can solve any problem in the community if everyone will be involved in finding the solution. 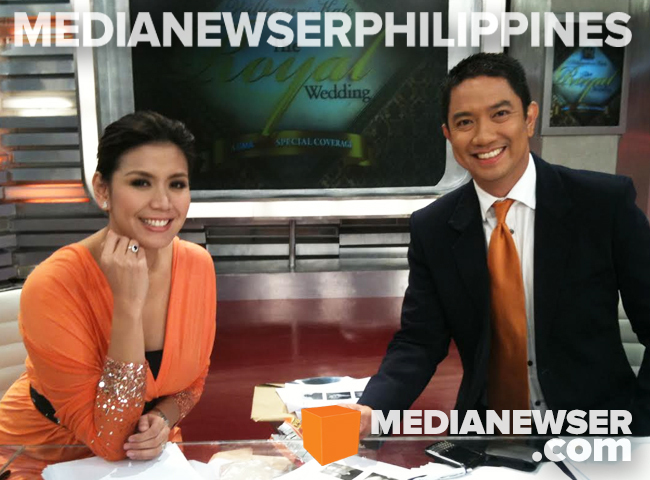 After serving as primary substitute anchor for Mel Tiangco on Frontpage: Ulat ni Mel Tiangco, Rhea joined the now-defunct Kapuso evening newscast full-time in 2003, anchoring its GMA Action Force segment. You've anchored many newscasts from Frontpage, News on Q, Saksi and 24 Oras — how would you describe your anchoring style? There’s nothing complicated about my anchoring style. I just make it a point that I am prepared when I sit on that chair, mindful of what needs to be done and ready for anything that will come my way. Preparation entails research, lots of reading, listening to the thoughts and inputs of my peers and other people, and analyzing situations so I can better understand issues. Our viewers need news and information and I am there to give them that. I never stop if there’s a need to investigate or extract information because we owe Filipinos the truth. Tell us about your stint at Reporter's Notebook. What would be your most memorable interview/coverage during your time there? I was given the opportunity to work with the people of Reporter’s Notebook for a year. My most memorable coverage was in Cotabato a week after the Maguindanao massacre. Some families where fleeing Maguindanao at that time to avoid the tension the incident created. The most memorable interview was my interview with Congressman Jules Ledesma who was controversial at that time because he was nowhere to be found during sessions in Congress. It was also the first time that he addressed queries on his sexuality. You were able to do a couple of documentaries for I-Witness, one of which, Abakada Ni Ina, earned you a Catholic Mass Media award. Do you miss doing long-form pieces? If given a chance, what do you want to tackle on the show? I can still clearly recall what we went through to produce the story of Teaching Aying who was once a street child and dedicated herself to educating street children in Davao. Earning the Catholic Mass Media award was unexpected and I consider that as one of the greatest achievements in my career as a media practitioner. If given a chance, I would like to get to know President Rodrigo Duterte more and document his life inside and outside Malacañang. People see him as different and I’d like to look into the soft spot of the tough president we all know. 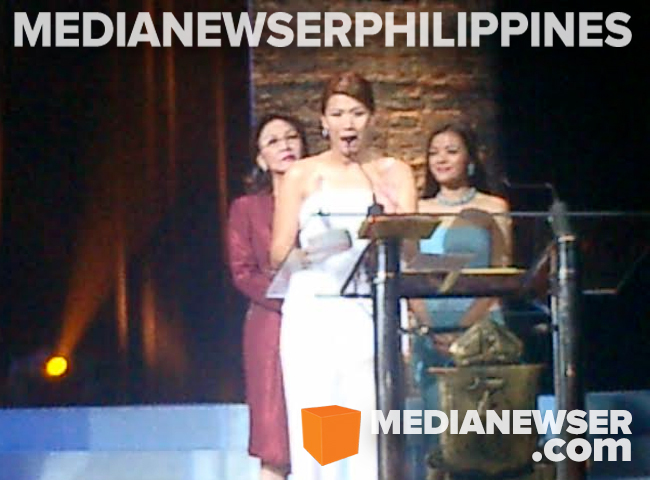 Rhea's I-Witness documentary "ABAKADA ni Ina," which was about a teacher in Davao City who dedicated her life in teaching street children, took home the Best TV Magazine Show award at the 2004 Catholic Mass Media Awards. Tunay Na Buhay had been through many reiterations — from profiling ordinary people, now you're basically telling the stories of local celebrities. What do you want to achieve with the show, and also how much do you enjoy doing it? People love to know the life stories of their favorite actors and actresses especially those who have gone from the limelight. The beauty of the show comes from the honesty of these celebrities to address controversial issues in their careers and their candidness to talk about their life behind the camera. I am happy because I gained a lot of friends in the entertainment industry from shooting Tunay Na Buhay. I am blessed to have the gift of sensitivity to my interviewees, a listening heart and the ability to throw the right questions. In exchange, the people I talk to entrust a part of their lives that has never been discussed before. We hope to impart inspiration to our viewers that like the people we idolize and look up to, we all go through difficulties and challenges in life. As one of GMA-7 leading female news anchors, Rhea has anchored many of its major news coverages including the 9/11 attack in 2001, the Royal Wedding of Prince William and Catherine Middleton in 2011, and the impeachment trial of CJ Renato Corona in 2012, among others. You are known as one of the best interviewers in local news. How would you describe your own interviewing style? Also, any interviewing tips you would like to share to our readers? I am an interviewer who prepares for my subject. I make sure I study the research handed to me and do my own research as well. I always put myself in the shoes of the viewers and consider what they want to know and how they can best understand the topic. My interviewing tips to MNP readers would be to come prepared, mindful of the direction of your interview, and to learn how to listen. It is in listening that you can throw the best follow-up questions. So, who do you want to interview next? Give us your dream interviewee. My dream interview would be a one-on-one with President Rodrigo Duterte. I am a wife to Carlo, a businessman, and a mother to two boys, 9-year-old Uno and 5-year-old Yuan. Carlo is my critic when it comes to my work. I consult him in every decision I make. He has been supportive ever since I met him. He even served as our driver and production assistant in some of my Pinoy Abroad shoots back then. I fall in love with him every single day for being so selfless and devoted to his family. We both know where we want to go and we have the same dreams for the family. Carlo is also a great cook. I look forward to coming home to his cooking and surprises. That’s his language of love. My boys Uno and Yuan are my inspiration, motivation and strength. They are our priority over everything else. My boys know what I do and they’re always thrilled when they hear people call my name and come up to me. They’re both people persons and that’s the way I want them to be. Any hints of future journos among your two kids? Too early to tell but this early, they exude confidence performing and talking before an audience and in front of the camera. They would sometimes pretend to be reporters but end up twisting their tongues when they talk in Filipino. Just recently, my youngest insisted on wearing a necktie going to the mall because he said he’s a newsman. What are some of the valuable lessons you have learned from your family that made you not just a better person but also a more effective journalist? I was brought up by parents who emphasized the value of respect and having a heart for others. As someone blessed to be part of the broadcast industry, I do not treat the people I talk to as mere subjects. They are people with stories to tell. They are the soul of every interview and I am there to listen and tell their story. "Personally, success for me is having the right attitude when faced with challenges. I have small successes each day and what’s important for me now is what I have become. I have already succeeded when I have become an optimist." Not many people know this but you are also an entrepreneur. Tell us about your business ventures. I started my company Curioso Cuori Inc. (Curious Hearts) two years ago. I am the official distributor of Curious Chef Real Kitchen and Baking Tools for Kids which help families create wonderful memories with their kids in the kitchen. These products have changed the dynamics in the kitchen which was once off limits to kids. With these safe kitchen tools for kids, parents do not need to worry anymore when their children participate in the cooking process. On our second year, we acquired the exclusive distributorship of Sipahh Milk Flavoring Straws which are straws containing flavored beads that transform milk and other milk substitutes into different flavours. I love this product because it encourages kids to drink more milk. Parents would also come up to me and say thank you for bringing in the product since it has helped their kids drink milk. Curious Chef and Sipahh are products that my kids love. I figured if my boys love these, then I’m sure other moms would love it for their kids. What is that one thing that a lot of people don't know about you that you would like to share to our readers? One thing probably that most people do not know about me is that I have the passion to dance. Dancing, for me, equates to happiness. If I am in my element, I dance like no one is looking. Life has been good to me. I am happy because God has given me a loving husband, beautiful and loving children, healthy parents, a simple and happy home and a great career. I am grateful but not yet content. I don’t stop dreaming for my family. I know my direction but there’s a feeling of uncertainty. I go forward, though, because I am not afraid of change. You have done many things over the course of the last 16 years. At this point, is there anything you would like to do professionally, or are you where you wanted to be in your career? If given a chance, I would like to be part of a talk show that would be a venue to exchange opinions of people from different generations... something like the American talk show The View from ABC. The road to success never stops. There will always be new goals and wants. Personally, success for me is having the right attitude when faced with challenges. I have small successes each day and what’s important for me now is what I have become. I have already succeeded when I have become an optimist. Professionally, I consider still being part of Unang Hirit and doing what I love for 16 years as my biggest success. What's the best advice would you give to those who might want to join the news industry? I always tell students when they interview me to follow what their hearts desire because it is important that you are happy and passionate with what you do. Once you are here, study, come prepared and never be afraid to ask questions. It will help if you observe and listen to the things around you because viewers watch people who understand them and they can relate with. Being in the news organizations is a calling and a responsibility. Do not take being here for granted.